Our world-class platform helps you reach your customers with custom and templated solutions for web, social media, mobile, and text messaging. With over a thousand promotions under our belts, we have the expertise to run any kind of promotion. Video contests, photo galleries, retweet-to-enter, custom games, text messaging, instant-wins, apps for Facebook, Twitter, Pinterest, and Instagram — if you can come up with it, we can deliver it. We design, build and host your promotion on our secure, stable, 24/7 monitored platform — already trusted by some of the biggest brands in the world. Your customers are always on-the-go. 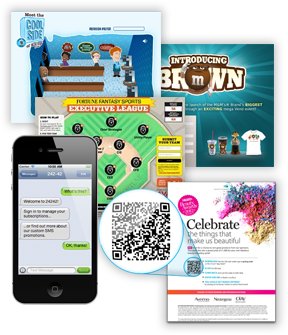 Engage them from anywhere with mobile responsive promotions. 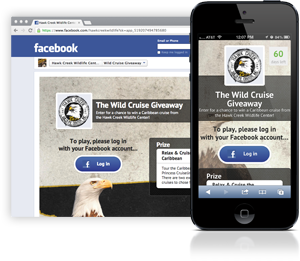 Drive traffic with social media posts, scannable QR codes, & mobile advertising and be assured that people can enter in seconds from the palm of their hand. 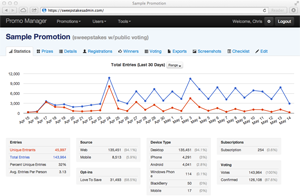 Monitor the success of your promotions in real-time, with full access to a wide variety of detailed statistics. Drill down to individual entry details, export opt-in lists, compare desktop versus mobile entrants, and more. All you need for the administration of your promotion is right at your fingertips!